Are Your Expectations Working Against You? There’s a topic I wanted to bring up that deals with the expectations we put on ourselves to do, well, most things in life. But, specifically, to overcome years, or even a lifetime, of struggling with food and body image. And it’s these expectations that are by far one of the most challenging components of the work that I do with others. 12 years ago, if you would have told me that I’d be where I am today, there’s no way I would have believed you. Food and my body used to CONSUME me. I couldn’t eat pizza or dessert without bingeing. I felt completely out of control and had basically come to accept that this was just the way my life was going to be. And while I felt pretty hopeless there for a while, I reached a point where I wasn’t willing to live my life like that anymore. So, even though it felt like I was crawling through cement, I reached out for help and began inching myself towards the freedom I longed for. And it took a long time. Longer than I imagined. When I made the commitment to break free I had convinced myself that I could rise above my eating disorder and just stop it, not recognizing that I was contending with 10 plus years of disordered eating and thinking. I had gone into recovery believing that just because I didn’t want to binge and purge or obsess anymore that that was enough, and therefore, the expectations I placed on myself were right in alignment with that thought. But then I relapsed. Then relapsed again and again and again. And while it felt like a punch to the gut each time, it was the slivers of progress I had been experiencing that kept me going. Binges were becoming less frequent, I had removed a huge trigger from my life, and I had slowly starting shifting the behaviors and beliefs that were playing a role. Recovery, whether it’s from an eating disorder, chronic dieting, emotional eating, or a poor body image takes time, patience, and a boat load of compassion. The journey will not go as planned. It’s one that will ebb and flow and likely bring up emotions you didn’t even know were there. Some days will feel as though you’ve gone one step forward only to find yourself two steps back, but that’s part of the process; not a sign that you’re doing something wrong. And expecting anything else will only lead to disappointment and frustration. I don’t say this to be discouraging, but I’d be doing you a disservice if I didn’t. I’ve worked with far too many women who expect to rid themselves of a life long struggle in a week or a month only to find themselves immobilized. But, this doesn’t mean that progress won’t be made along the way, it might just be hard to recognize at first. Even if it comes with some back peddling. And I promise you, it will be one of the greatest gifts you can give yourself. 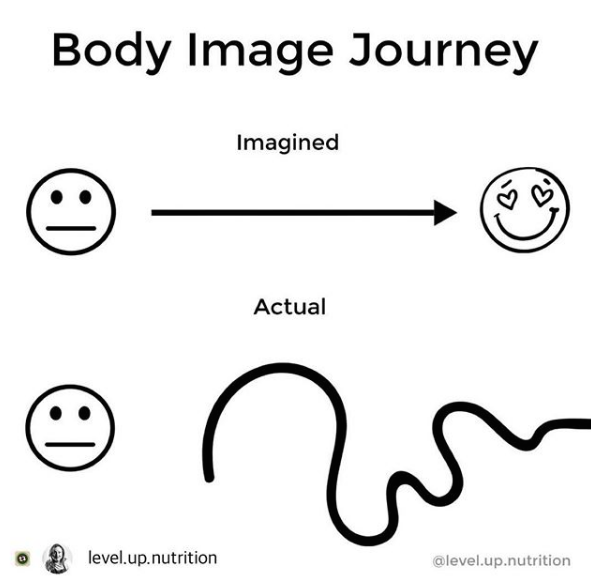 Think about where you are on your journey and where you want to be. Do you feel like you’re stuck because the path seems long and bumpy? Maybe even hopeless because of past attempts and what feels like failure? What would it look like to just take one small step forward instead of the leap that you expect of yourself? Want to learn more? Head over to the blog. And if you’re ready to dive in and move forward, let’s chat!